"I am eye. I am a mechanical eye. the likes of which only I can see." modes of representation must change." The documentary film, more than any other form, feeds the innate interest humans have in other humans. We're interested in people's daily lives, their thoughts, opinions and feelings, of who we are and where we come from. In the age of reality television and the internet, that most primal of curiosities is more omnipresent and potent than ever before. If you're a documentary filmmaker, I'd argue that this impulse is stronger still, and though it might seem something of a basic qualification, it's also the driving force behind the emergent works of British filmmaker Marc Isaacs. With just six films to his name, he's already an award-winning director, hailed as one of the best filmmakers of his generation, and it's not difficult to see why. Since 1999's Lift, which chronicled the literal comings and goings of the residents in a London tower block as they rode up and down in it's lift, Isaacs set himself apart as a filmmaker who was not only interested in observing other people, but also with engaging with them. Anyone who has already seen Lift, or any of the five films which followed it, such as Travellers, which traded a lift for a train, and saw Isaacs conversing with a number of passengers over several journeys; or Calais: The Last Border (all of which can be found in Second Run's first volume of Isaac's releases), which follows refugees of all kinds making life for themselves in the northern French port; will know that he isn't a filmmaker who stands back and watches his subjects like a scientist viewing slides under a microscope. Instead, Isaacs is a man who zooms in his lens, probes and asks questions, before refocusing and starting the whole process again. On paper, Isaacs' body of work appears rather disparate and oddly disconnected, but the strength of his work stems from the running themes which unite the films he makes. Broadly speaking, all of his work to date, encompassing the documentaries All White in Barking and Men of the City are about survival, about living each day in a changing world, constantly re-configuring ourselves in the face of those changes be they social, cultural or economic. The stories Isaacs presents are by no means unique, but the way he approaches them is, and it's this quality which makes his work so special. This seventy-two minute film is perhaps the most famous amongst Marc Isaacs' growing body of work. 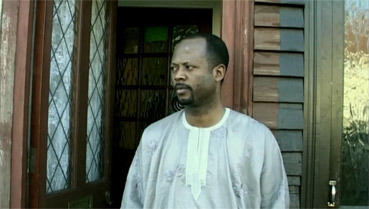 All White is Barking, his fifth feature overall, is an exploration into the attitudes of a group of white Barking residents toward their immigrant neighbours, at a time where tensions in the London borough were equal to the levels of immigration, thanks to a rise in voter support for the BNP, making it the second largest political party in the area. By May 2010, these seats were ultimately lost, but far from making Barking a redundant film, it remains a vivid and insightful snapshot of racial attitudes at a particular point in contemporary British history. 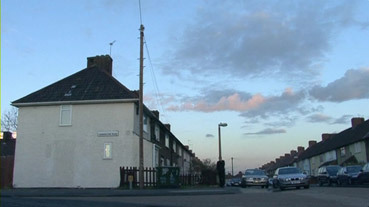 Originally screened as part of BBC's White season, on the face of it, Barking exemplifies the term, 'hot button,' conjuring up images of flag burning, riot and the kind of radicalised viewpoints which would undoubtedly add fuel to the fire, inciting further racial hatred and perpetuate already common stereotypes rather than promote understanding and tolerance. However, Barking doesn't fall into this obvious, salacious trap, and favours the latter approach, by offering up opinions from all sides, ranging from Bow native, Dave, a staunch supporter of the BNP, to Dickson, a young Nigerian family man, who takes great pride in the fact he stands on his own two feet, and believes England has provided him with the better way of life he's always yearned for, even if the people he comes across aren't always as open or accepting of him as he'd hoped. Yes, the issues at hand are contentious and incredibly delicate, but Isaacs' command of his material is deft, as is his grasp of the subject. Yes, you will be shocked by some of the things that these grandfathers and grandmothers come out with, because it dares to present people whose opinions run counter to the idea of an inclusive, multicultural Britain, but it doesn't stop there. Isaacs proceeds to challenge their opinions, without once being confrontational or derisive to anyone involved. Just as people of Barking are never judged, we aren't preached at either. After the director's camera makes their lives a part of ours, we're ultimately left to make up our own minds how we feel about them as people, what they represent and how they express themselves. Regardless of your own viewpoint, this film will challenge you, and make you question you own beliefs into the bargain. Where Barking excels is the way in which Isaacs dispenses with classic elements of documentary technique. The fact that he questions the people he films, is, at first jarring, especially if you're used the rather distant, cool, analytical kind of documentary, then the friendly, inquisitive and active figure of Isaacs will come as something of a shock, but this Barking – and his work as a whole – is all the better for it, because he creates a film which is thought-provoking on an intellectual level and engaging on an emotional one, because through talking and prompting as we might, he uncovers moments of genuine emotion, and reminds us that maligned figures, be they a man harbouring racist views or an immigrant building himself a new life, are also human beings. It would have been incredibly easy for Isaacs' film to turn into a lament about the segregation and division we all encounter in modern society, and while Barking does indeed have moments where such thoughts are expressed, this isn't a film which is interested in perpetuating those ideas. One moment, we're shown butcher Steve, discussing how the changing face of the street beyond his shop is changing the buying habits of his customers. The next, we watch Barking local Sue and her husband Jeff, wary of the Nigerian neighbour Dickson, see footage of them straight from Isaacs' camera, where he talks about how lonely he feels, since no one has talked to him. Her guilt is palpable. You could argue that Isaacs oversteps here, and his role is too invasive, since he later facilitates a meeting between the two households, which sees Dickson and his wife Victoria invite their neighbours over for dinner. Though sometimes comedic in its awkwardness, they do come to enjoy each other's company, and upon their return home, Sue looks back over the evening, and whilst some of her opinions remain the same, she also admits she was wrong to make snap judgements about the family before meeting them. In many ways this is a celebration of what can happen when people connect with and embrace other cultures. Barking's shining example of a progressive outlook comes in the form of Polish Jew Monty, and his friendship with Nigerian Betty, who acts as his carer and companion. The two co-exist happily, and Betty both embraces and respects the traditions of Monty's culture. Their biggest test comes when Holocaust survivor Monty attends a dinner commemorating the liberation of Auschwitz and takes Betty along with him. A stoic gentleman, his discussion of those years is understandably brief, but no less powerful, are amongst the film's most moving sequences. The reactions of Monty's friends and fellow attendees to Betty's presence are both diverse and contentious – some embrace her entirely, clearly referencing their own persecution, whilst others feel uneasy, commenting that Monty may be better off with another Jewish woman. 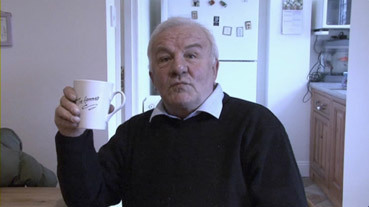 To err is, as they say, human, and some of the most interesting points in the film occur when the residents express opinions that are contradictory, without making that connection themselves. A prime example is an early conversation with Dave, and his grown-up daughter, Charlie concerning her son, a mixed-race child, from her relationship with a Nigerian man. In the young boy's presence, Dave is a typical grandfather, open, warm and affectionate, and yet, in the kitchen with Charlie, he voices concern that he believes his grandson will struggle in later life because of his dual heritage. The conversation takes several turns, where Charlie mostly dismisses her father's thoughts, as she deems them to be outdated. However, there is something they both agree on: that bigotry exists in all races. Dave, of course, doesn't see himself in those terms or recognise that elements of his behaviour are perceived in the same manner. All White in Barking may begin as film about race and migration, but that's only the beginning of what this engaging, complex, surprisingly humorous, and at times, incredibly moving film encompasses. When watching, you can't help but be struck by how overwhelming similar people are, and that we ultimately all want the same thing: to be loved, to be needed and, pivotally in the case of Barking, to be accepted. If this film carries a message, then this is it: though we may look different and embrace different cultures, we are still all citizens of the world. In our current climate, Isaacs' latest feature, Men of the City, is a rather timely one. The most stylised and accomplished of his films to date, he originally intended to use his unique approach to follow, as the title suggests, a wide-range of men working in the city, both inside and outside the world of finance, including everything from high-flying city broker David, and Bangladeshi immigrant Fakhrul, a single father working two jobs to support his daughter. From this comparison alone, it's obvious that Isaacs achieves this aim. However, fate would intervene and provide him with an opportunity to get an insiders perspective on London during the unfolding financial crisis, which lends what is already a compelling film in its own right, an added layer of importance. Given the circumstances, it would have been easy to make City a rather bleak documentary, and to some degree, Isaacs even plays with this expectation. 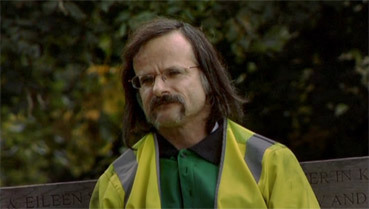 The opening of the film, which follows spiritual roadsweeper Steve's journey to work in the early hours of the morning, is filled with an air of foreboding. London's famed landmarks loom large in the rain, and Michel Duvoisin's music carries as much imposing grandeur, with a tinge of sadness thanks to Nuri Köseoğlu's lone violin, piercing the darkness. Of course, my reading of the film will be coloured by hindsight, just like and everyone who watches it, but these decisions feel anything but arbitrary. I'm painting an incredibly atmospheric picture here, and with language more commonly used in relation to narrative rather than documentary cinema. A semantic quirk perhaps, but it's also indicative of, at various points, how unlike a documentary City is in look and feel, but retain a quality which is unmistakably Isaacs' alone. A particularly striking instance occurs when we meet Andrew, a broker on The London Metal Exchange. Amidst his frenzied work environment, he talks to Isaacs about his life outside of work, commenting upon his passion for hunting. There follows a sequence which contrasts his colleagues at work on the exchange, shouting out prices and offers to each other across the floor with sounds of the hunt, and pictures of what we can presume are animals Andrew has either tracked or shot. A clever little parallel though it may be, it's easy to wonder if Isaacs is poking fun at the man for the pursuits he enjoys. However, I don't believe the correlation he's drawing is as simple or insensitive as that. When Isaacs questions Andrew over whether he believes there to be a relationship between the two, he's quick to dismiss it, but the seed has been planted, and certainly blooms throughout the rest of the film. The choices Isaacs makes within the editing and soundtrack serve to setup the idea of the City, and particularly the world of finance as a rather Darwinian environment, a theme which recurs throughout the film and is referenced directly by stockbroker David, when he outlines his expendability, and elsewhere by others in the film, such as Steve and veteran insurance agent Norman express a desire to get out of the City and change their lives. Though Steve's comment that he feels it's "poisoning him" may seem a little farfetched, but when you look at Norman's tired face, long having fallen out of love with the daily grind of working, you may find yourself agreeing Steve, irrespective of your opinions on his New Age philosophies. As with his previous films All White in Barking and Calais: The Last Border, Isaacs treats these men with care and respect, and shows us a rather more complete picture of their life beyond the workplace. One of the most interesting turns the film takes (along with the journeys of Norman and Fakhrul) is through David. The collapse of global investment bank, Lehman Brothers happens before his, and our, eyes as he sits at his computer terminal, dividing his attention between multiple information screens and a television broadcasting the breaking business news. This state of high alert is where we frequently find him, even during a coastal holiday break, visited by his children and ex-wife. Through them, we see a different side to David, revealing his passion for photography, which is relegated to a hobby – and an alternate perspective on City life, which we would otherwise never see from his estranged wife, as she describes what it was like living with her husband or rather not living with him, during their married lives. Public mood is such that anyone trying to evoke sympathy for a City financier will find it a rather hard task. And yet, this is exactly what the film manages to achieve in its fifty-eight minute running time. Granted, it's not likely to single-handedly turn the tide, but just as Barking did before it, Isaacs presents us with perspectives and ideas to interpret in our own way. As a result, for a few moments at least, City may make us wonder about the genuine human costs of economic meltdown, as well as the financial ones. Though the future for these men and England as a whole is uncertain, Isaacs' film offers the faintest glimmer of hope and reminds us what can be achieved if we persevere. Both films have received excellent 19:9 anamorphic transfers here. All White in Barking appears to have been shot on DVCAM (the format favourite, a Sony PD-150, makes an appearance) and has an impressively crisp level of detail, nicely balanced contrast and natural colours. A clean and well-balanced picture for the most part, there is some digital noise in the darker scenes, and a strong green tint to dimly lit interiors, but both of these are par for the video course. Much of Men of the City has a 16mm film look, while some shots have a more digital crispness, but a fine level of detail, well reproduced colours and solid contrast are evident throughout. Black levels on both films are spot on. The restored stereo soundtracks on both films are very clear, with excellent recording quality on the interviews in particular. The soundtrack of Men of the City in particular has real breadth to the mix, giving punch to a storm, a crispness to rainfall on the street and a fullness to the music. As with Second Run's first volume of Isaacs films (comprised of Lift, Travellers and Callais: The Last Border), All White in Barking and Men of the City look great, thanks to their director- approved digital transfers, but the hard work, care and attention doesn't stop there. The supplemental material is typically fine, and while they're a bonus for most in relation to the main features, these are a great deal more than a hastily thrown together adjunct; befitting of a director who is steadily building a body of work known for its quality. Directed by Paula Nightingale, this interview with editor and series producer of BBC's Storyville, Nick Fraser, is a valuable addition since it underlines, very quickly indeed how influential Mark Isaacs has become to the documentary format and how his work fits into the series remit. The piece combines footage of Fraser in his office, classic talking head style with excerpts of All White in Barking and Men of the City. Fraser talks about the genesis of both films in turn, as well as the broader connections between them from a social and cultural perspective. Some of the nicest moments here arise from his reflections on enjoyable and/or memorable moments tied to both films. His admiration and respect for Isaacs is clear, as his comments are drawn from personal experience, but more than that, they also highlight the powerful connection he has with Isaacs' work as a person and not just as someone who works within the industry. A great watch, and a more than worthy companion to the films presented on the disc. Alongside the usual production credits for the film and supplemental features, the illustrated booklet features an essay written by Noel Megahey of online film magazine, The Digital Fix. Like all the essays featured in Second Run booklets, Megahey's caters to a dual audience: those familiar with the work of Isaacs and those not, by marrying more detailed discussion of his films within a wider biographical framework, with references made to all of the director's output in some form. Everything is drawn together nicely by Megahey's exploration of mercy within Isaacs work. This is a well-written piece that's informed without being overly academic, providing an insightful and enjoyable read. All White in Barking and Men of the City are exemplary of documentary cinema at its best: powerful, illuminating and honest. Marc Isaacs' work is crafted with an inquisitive yet incredibly skilled eye, and provides a perspective on modern Britain which is entirely unique. Highly recommended.